It´s a long way from Portugal to Finland, and one rarely travelled by Moonspell. The last time I saw them was at Tuska 2007, and the announcement of their visit to our country for a short club tour was as surprising as it was welcome. To further improve matters, the second band on the bill was Swallow The Sun, who haven´t played a whole lot of domestic shows in the past couple of years either. The best package of this tour was awarded to Jyväskylä, were the opening slot was filled by Omnium Gatherum, who just recently released one of the potential albums of the year, but I neither had the time nor the money for the 300 km trip in the middle of the week. 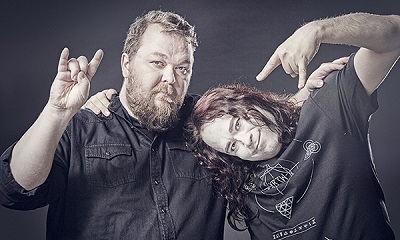 The Helsinki gig was opened by Cataleptic instead, who have been around since for several years and published their debut album in late 2011, but so far have failed to make much a name for themselves. Unfortunately their show was in no way impressive enough to change this, they played generic doom/death which didn´t offend the ear but was quickly forgotten after the last note. All the more since Swallow The Sun wasted no time in showing what doom metal sounds like at its best. Majestic, powerful “Descending Winters” opened the set and reminded everyone that this used to being a headliner in its own right. Fortunately the venue had deviated from its usual late showtime policy and allowed the bands to start early enough for long sets. STS played ten long songs and a veritable hit parade at that. Aleksi Munter´s keyboards and Juha Raivio´s guitar were a bit difficult to hear in the beginning, but the sound got better before long, well in time for the beautiful guitar solo in “Cathedral Walls”, one of the highlights of the set if its necessary to single out any. I might just as well name the following one, “Hold this Woe”, which again represented the heavier end of the spectrum. But the set was of consistently high quality from beginning to end, and even with no other band following, it would have been a worthwhile evening. And yet we hadn´t even seen half of it. When the long-expected Lusitanians entered the stage, frontman Fernando Ribeiro wore a helmet as if prepared for battle, but the audience surrendered to the conquerors without as much as a hint of resistance. After “Axis Mundi”, the helmet was discarded and the black mane was free to mosh. Although Fernando doesn´t move about the stage very much, the show was far from static. Besides an incredible voice, the man has an almost shamanic gift for holding an audience in thrall, not to mention a very capable orchestra around him. For “Opium”, he enlisted the help of Mikko from Swallow The Sun, while guitarist Pedro Paixão switched to the keyboards. “Opium” in particular was announced as treat for the old-school fans, but it was not destined to remain the only one. In fact we got two thirds of Wolfheart and four songs from Irreligious, roughly balancing the number of songs from the last three albums, “Alpha Noir” being the natural focus. The years in between were only represented by a handful of tracks, but you have to draw a line somewhere, and clocking in at a full two hours, I daresay the set didn´t leave anyone dissatisfied. And long as it was, it never felt lengthy, the intensity of the delivery being matched by the enthusiasm of the response. From the mixture of whispers and screams in “Everything invaded” or the back-to-back pairing of the raw “New Tears´ Eve” (dedicated to Peter Steele, whom Fernando remembered to have seen at Tavastia in Helsinki, of all places) and the tender “Scorpion Flower” to the cavalcade of classics at the end, the setlist was a prime example of well-structured dramaturgy. After everyone´s favorite “Alma Mater”, the band retreated for a well-deserved break but before long came back for a long and powerful encore comprised of “Wolfshade”, “Mephisto” and the final culmination, “Full Moon Madness”.If Moonspell felt they owed Finnish fans something after the six-year wait, I hereby testify that the debt has been paid in full.